Using recycled plastic fibres (including fishing line, mesh nets, garden trellis, fruit bags and packing strap), Linda Erceg stitches, knots and heat-treats her materials into complex organic structures. Seed and Spawn is an installation of sculptural forms. Hybrid patterns of propagation and growth cover the surfaces of the gallery space, traversing the walls and ceiling. The title suggests the reproductive and generative processes of both plant and animal life, however the work simultaneously materialises a dangerous threat. The contemporary hazard of plastic waste, as it literally chokes out terrestrial and marine ecosystems, is physically enacted in Linda’s work. As you enter this world of beautiful, colourful, translucent, tactile, entangled plastics; you are invited to question your own role in the life of these materials. 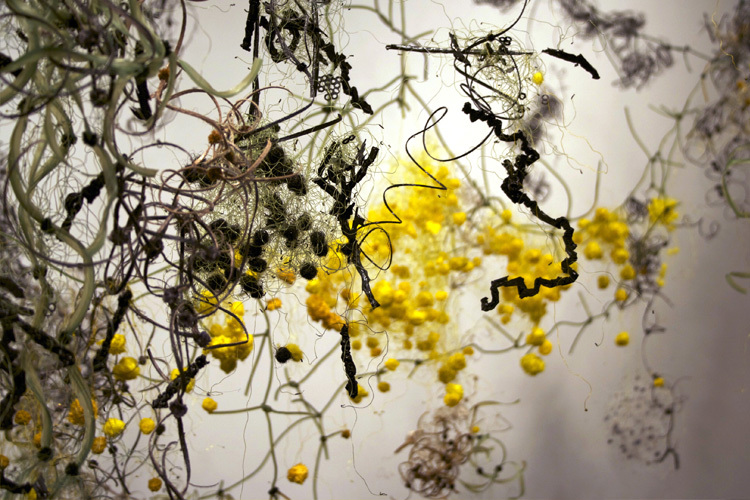 Seed and Spawn presents an intimate and evocative encounter with plastics; revealing both their innate beauty and their potential for ecological damage. Join Linda Erceg and other artists exhibiting at MAC, for “Conversations with the Artist” 1pm Sat 28 Apr. Meet the makers, and learn more about the artworks and the stories behind them. All welcome, free entry.